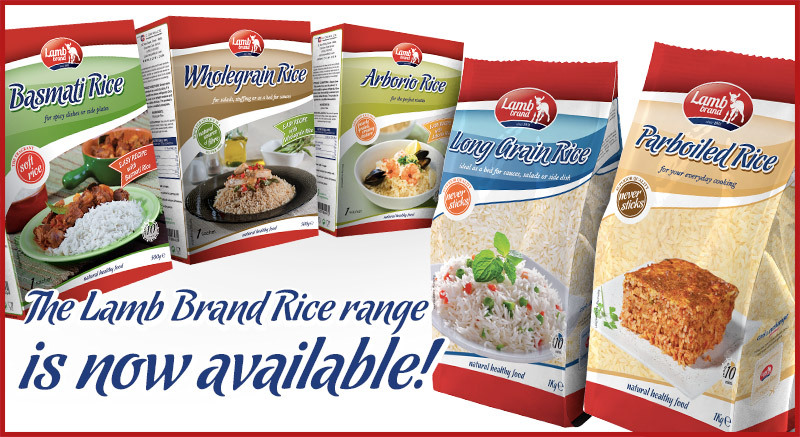 Lamb Brand is happy to announce the launch of their new range of Rice which is available in 5 different varieties: Long Grain, Basmati, Parboiled, Arborio and Wholegrain. Each 500g packet comes packed in a carton box, designed exclusively for Lamb Brand. Long Grain Rice and Parboiled Rice are also available in family packs of 1kg bags. Each type of rice has a different shape, characteristic, and flavour. Long grain rice is about four or five times as long as it is wide and makes a perfect accompaniment to any dish. Long grain rice is long and slender. The grains stay separate and fluffy after cooking, so this is the best choice if you want to serve rice as a side dish, or as a bed for sauces. With its perfect whiteness and fluffiness the Lamb Brand Long Grain Rice is ideal for both Asian and Mediterranean meals being it entrées, salads, sides or desserts. The name Basmati means ‘Fragrant’ due to the highly scented aroma released during cooking. The light and fluffy grains of basmati rice are much longer, having a subtle flavour and naturally white colour. Lamb Brand Basmati Rice perfectly complements spicy Asian dishes, but also adds flavour to many other cuisines. Parboiled rice has been partially boiled in the husk. Thanks to this special process apart that reduces cooking time, it stores nutrients, including thiamine and makes white parboiled rice up to 80% nutritionally similar to wholegrain rice. Lamb Brand Parboiled Rice is an all-purpose type of rice, which is good enough for your everyday cooking. High in nutritional values, firm and non-sticky, parboiled rice is ideal for salads and baking. Short, fat and slightly oval-shaped, Arborio rice has a pearly white exterior which surely makes a tasty and lovely creamy risotto thanks to its starchy characteristic. It gives personality to all recipes, even the most simple. Use Lamb Brand Arborio Rice for sushi, puddings or as a substitute for Spanish Paella. Wholegrain rice also known as brown rice is naturally a good source of fibre and low in saturated fat and salt, supporting a well-balanced diet. Lamb Brand Wholegrain Rice is suitable for any type of recipe. Prepare a cold rice salad or use it as a side to a tasty creamy meat or vegetarian curry.